The venerable BOSS RV-5 has long been a players’ favorite for its great tone and simple operation. Now, the new RV-6 goes beyond its predecessor with even better sound and more reverb types, thanks to newly developed algorithms and the very latest high-speed DSP. Housed in the rugged BOSS compact pedal chassis, the RV-6 is easy to use and built to last. But while it’s a simple stompbox on the outside, this little powerhouse is a monster studio-quality processor at heart. The RV-6 is housed in the time-tested BOSS compact pedal chassis. The RV-6 offers eight different reverb types, letting you dial up the perfect ambience for any sound or style. Everything you need is here, from subtle bloom to long, evocative spaces that float your axe on dense clouds of sound. Essential reverb types include Room, Hall, Plate, and Spring, and each brings their own distinctive sonic character to your tone. Modulate is a variation on the Hall type; it adds a pleasing modulation to the reverb tails, creating an enveloping richness long associated with famous high-end studio reverb processors. Lush, “bigger than life” reverbs have become extremely popular with modern players, and the RV-6 is fully capable of delivering this immersive ambient goodness. The Dynamic type automatically adjusts the effect depth to your playing touch, providing deep reverberation that doesn’t compromise clarity. Shimmer incorporates pitch-shifting and other processing, adding an ethereal, floating dimension to your tone. Finally, the +Delay type lives up to its name by combining two great effects in one. The versatile RV-6 includes eight distinctive reverb types. Like all BOSS stomps, using the RV-6 is quick and intuitive—just select a sound mode, tweak the Time, Tone, and Level knobs to taste, and play. But under the hood, there’s a lot more going on than the simple interface might suggest. Basically, BOSS has done the heavy lifting so you don’t have to. 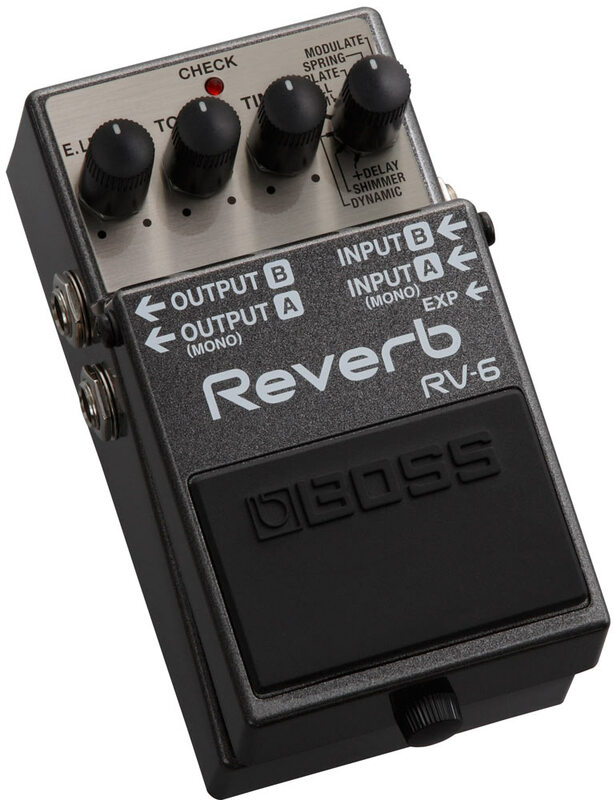 Each mode in the RV-6 includes a huge range of detailed internal reverb parameters, all perfectly tuned for guitar by BOSS with direct input from pro players and sound engineers. Additionally, these parameters are not fixed—as you tweak the selected mode with the Time and Tone knobs, many variables are simultaneously balanced inside to create the ideal voicing for every setting. 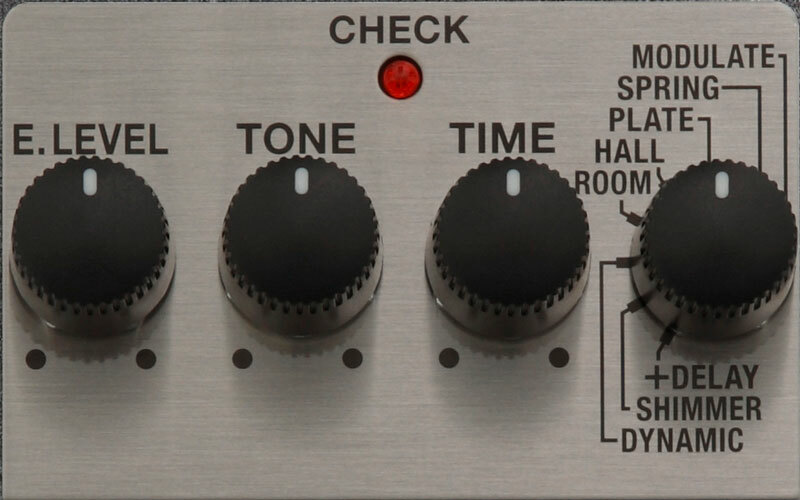 The controls on the RV-6 Reverb are simple and intuitive. With support for mono, mono-to-stereo, and stereo-to-stereo operation, you can integrate the RV-6 with any pedal chain. Just plug into the jacks, and convenient auto-switching configures the pedal internally as appropriate. By plugging into the B input only, the RV-6 outputs a 100-percent wet sound, a useful feature when creating parallel chains with mixers or advanced effects switchers like the BOSS ES-8. This also enables use in a send/return bus for processing studio tracks. 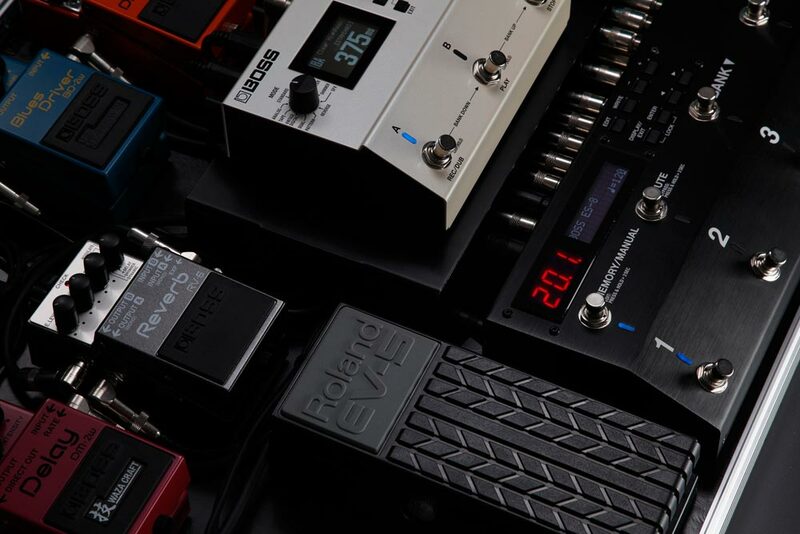 In addition, the RV-6 is equipped with a jack for connecting an optional expression pedal, allowing you to control the effect level in real time as you play. RV-6 Reverb on a pedalboard with the BOSS ES-8 Effects Switching System. 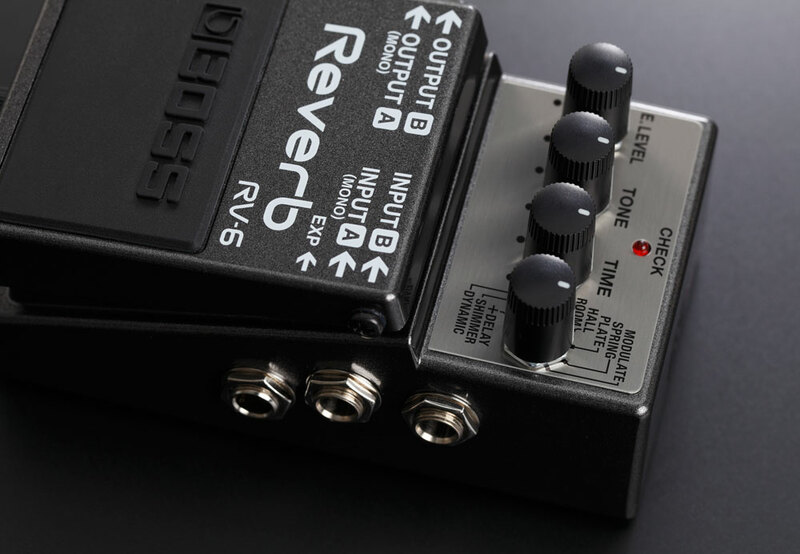 Visit the RV-6 product page to learn more about this exciting new reverb pedal.